When the Taliban withdrew in 2001, they left behind an impoverished country with an unemployment rate higher than 40%. Illiteracy and lack of job skills made it hard for the survivors of the war years to find jobs, especially the millions of widows. All of this was compounded by the streams of millions of refugees returning from Pakistan and Iran in hopes of reclaiming a life in their own country. The government and international aid programs tackle training and development needs with limited success. But these examples of small-scale projects show what can be done. Hassina Sherjan has founded Boumi, a factory in Kabul that makes home decor textile products with Afghan raw materials, now employing about 60 people. 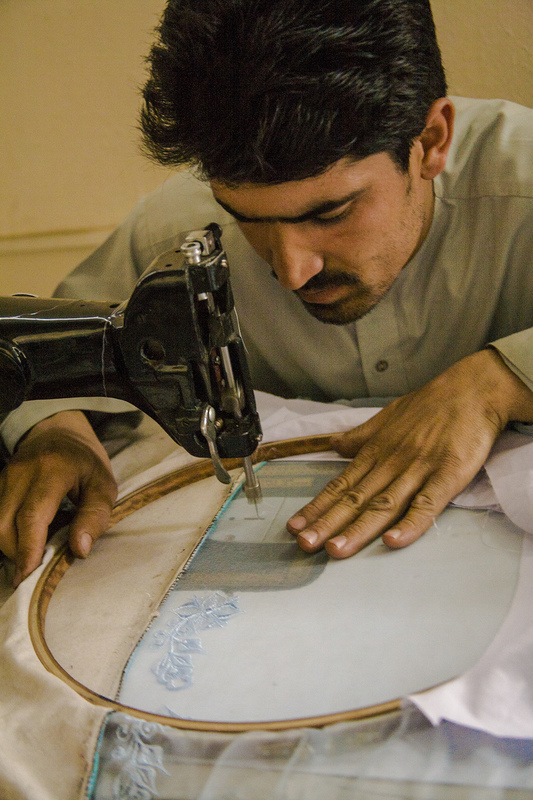 The master artisans of Turquoise Mountain Foundation are training young people in traditional arts and crafts, creating jobs and income based in a renovated section of the ancient city of Kabul. Shuhada Women's Training Center in Bamiyan teaches women the skill of fine jewelry making and carpet weaving. Mina Sherjoy's AWWSOM makes and cells high fashion clothing in Kabul.